In this week's Abundance Insider: Self-driving gardens, the smallest transistor ever, and a Holocaust survivor experiencing her own rescue in VR. What it is: A Holocaust survivor recently watched the recreation of her rescue in virtual reality, and as you might imagine, it was a poignant digital experience that demonstrates the genre's transformative potential. LIFE VR produced the VR companion piece for the upcoming PBS documentary "Defying the Nazis: The Sharps' War," which depicts the 1940 journey of the Excambion, a ship that transported child refugees from Nazi-occupied France to the United States via Portugal. Amelie Diamant-Holmstrom, then aged 13, was one of Excambion's 29 child passengers, and watched the VR recreation this past summer. Her reaction, depicted in the video at this link, is a must-see. What it is: Meet Hortum machina, B, the self-driving and self-cultivating garden designed by the University College London's (UCL) Interactive Architecture Lab. Hortum machina, B is made up of a robotic aluminum network of electrodes that monitors the garden's physiological responses to the environment. Using data gathered, the structure is then able to propel itself towards sunlight and to areas with lower air polution. The mobile ecosystem was tested in London in hopes to expand the city's green space to new terrain. What it is: The Holographic Type Sculpture digital graffiti art exhibit recently debuted at the Bellevue Arts Museum in Washington State -- but only for those looking at it with a Microsoft HoloLens headset. The tall structure, made up of letters and words, was placed in the museum by Microsoft user experience designer DongYhoon Park to demonstrate what the HoloLens can do -- for example, interact with another HoloLens user viewing the exhibit, or directly edit the graffiti that appears in the exhibit. What it is: Google's DeepMind team has announced its latest neural network AI, WaveNet, and it's the most realistic-sounding one yet -- performing 50% better than existing technology. Unlike most AI systems, which combine fragments of a single recorded human voice or a standard set of pronunciation rules, WaveNet can generate speech in multiple human voices, with variances in emotion and emphasis, and even auto-generate music. The key is in how DeepMind trained the AI: using raw waveforms, or the individual sound waves humans create. What it is: Sundrop Farms has developed the first-ever solar-powered greenhouse to grow food without using fresh water. The greenhouse facility sits on a field of more than 23,000 mirrors to capture sunlight and direct it to a central receiver measuring 127 meters. It produces up to 39 megawatts of thermal energy to use for electricity and desalinating water from the Spencer Gulf. What it is: Eighteen-year-old Harsh Songra has released an app called My Child that, over the course of 45 seconds, helps parents identify developmental disorders in their babies. The app isn't meant to replace a doctor's assessment, but instead help recommend doctors based on the baby's needs. The app is a passion project: Songra grew up with dyspraxia, a developmental disorder that affects motor and cognitive abilities, but wasn't officially diagnosed until he was 9 years old. What it is: Researchers at the Department of Energy's Lawrence Berkeley National Laboratory have created the smallest working transistor ever -- with an incredible 1-nanometer gate. 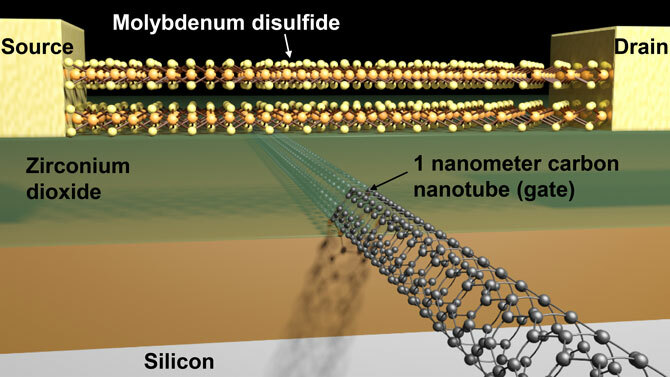 "The key was to use carbon nanotubes and molybdenum disulfide (MoS2), an engine lubricant commonly sold in auto parts shops," explains Berkeley Lab. "MoS2 is part of a family of materials with immense potential for applications in LEDs, lasers, nanoscale transistors, solar cells, and more." What it is: Boeing CEO Dennis Muilenburg recently announced his visions for a commercial space-travel market, putting Boeing toe-to-toe with Musk in the initial push to send humans to Mars. Boeing's focus is on building out the commercial space sector near Earth and research technologies to travel far beyond the moon. Boeing has partnered with NASA to develop the Space Launch System for space exploration, but Muilenburg said costs will need to drop substantially before experimental spacecraft can be used for commercial use. What it is: According to the journal ACS Nano, scientists reported the first fibers ever to be suitable for weaving into tailorable clothing and generating power using stored solar energy. Wenjie Mai and Xing Fan created the first fiber -- made of manganese-coated polymer along with zinc oxide, a dye and an electrolyte -- and interlaced it with copper-coated polymer wires to create the solar cell part of the textile. The second fiber they created was made of titanium, titanium nitride, a thin carbon shell to prevent oxidation, and an electrolyte. The two fibers were then woven with cotton yarn and made into a fully tailorable "smart garment," fully charged by sunlight.